Telly Savalas is back as the brilliant and brazen Lieutenant Theo Kojak for the final season of one of television's grittiest and most memorable detective dramas. 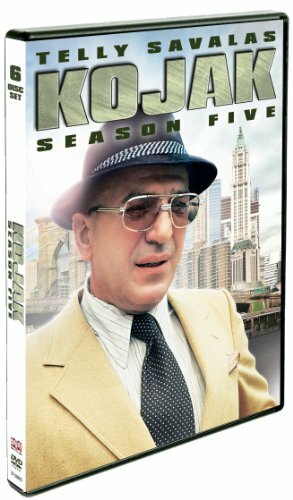 Kojak: Season Five will be released on DVD September 11, 2012 from Shout! Factory. Featuring all 22 original episodes, this six-DVD set is a must-have for fans of police dramas and DVD collectors and has a suggested retail price of $44.99. Season Five cases involve a psychotic murderer, a homicide-ridden hospital, cops on the take and the reemergence of a killer from Kojak's past -- once thought dead! Joining him throughout the season are special guest stars including Armand Assante, Christina Raines, Jennifer Warren, Misty Rowe, Shelly Winters, Ken Kercheval, Sally Kirkland, Jeff Conway, Liberace and Priscilla Barnes. Created by Emmy(R) and Academy Award(R)-winning writer Abby Mann, Kojak ran for five seasons on CBS from 1973-1978 and spawned a series of TV movies throughout the 1980s and '90s. Relive all his smart, edgy adventures in the mystery series that People Magazine raves is "a TV classic: slick, well-plotted and entertaining."